Looks like a great value at $1650 list for the 105 7000 version. I am disappointed they missed the braze on on fork. However it is a good thing I am still Twiddling thumbs on purchase. My line up is now the Niner RLT 853, the 2019 Giant Revolt, or this Cannondale Topstone. Great gear ratio for the 99% of us. flat mount hydraulic disc brakes. Tapered steerer full carbon fork. branded rims and hubs with good tires. that's a lot of value and quality from a big name LBS brand for that price. curious heat tube angle thru all sizes, but otherwise nothing glaringly offensive for geometry, at least for my size. I am not sure what fork brazeons would be for...a front rack or anything cages? It has mounts for a rear rack, but it isnt a touring bike or bikepacking bike. From what i have seen and read, almost nobody uses these bikes to bikepack thru back roads, its just the idea of using them that way is appealing. Maybe they decided to make a price concession at how to create the fork since they dont think most potrential buyers wpuld actually use the bike for loaded down bikepacking. Nice but totally bland looking. At least the Apex version has some color. I'd be interested in the Topstone if I didn't already have gravel riding covered with a couple of bikes. Cannondale got a lot right with the Topstone. Last edited by Pendergast; 08-26-18 at 08:01 PM. I wonder how low the price will go when the 2019's go on clearance this time next year. Last edited by TimothyH; 08-26-18 at 05:54 PM. I heard LBS say that the rep said Closeouts were a thing of the past for Cannondale. They will just be called last years model or old stock or something. Regardless I am weighing my needs. 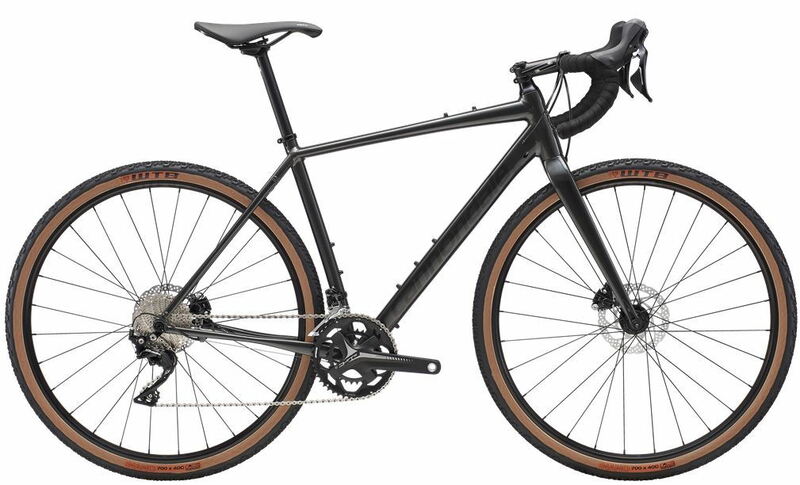 a 105 Topstone with $1000 1500g (Lightbicycle) carbon wheels is a lot of bike for $2600 Maybe it's time to ditch the panniers and buy bikepacking bags. Specs make it basically a CAADX with internal routing and extra mounts. If I ever need to replace my CAADX, I'd seriously consider the topstone, love the geometry, nice balance between responsive and stable handling. The geometry, the spec, the threaded BB . . . that looks really good! They check an awful lot of boxes for my ideal gravel bike. I wish they offered a frameset (because nothing beats Di2 in the mud). The Slate wasn't killed off. Cannondale still has it for 2019. That's the page for the 2018 model. I think they're going to kill the Slate. It's off the UK market now. They might be killing off the slate, but that doesn't really have to do with the topstone considering the price range they were offered at don't overlap much at all. The slate just wasn't a very popular bike, overkill for most. I hear ya about the price of the Slate. It took a couple of days of negotiation with my LBS and some ebay luck so I could get my Slate at $1500 but I wouldn't trade it for anything. It's my favorite bike of all the ones I have owned. Still don't think the Slate has been killed off. I've seen a few articles saying it's in the 2019 line-up. This article says it's even coming back to the UK market. Topstone is aimed at a lower pricepoint. I like the Slate. But I wish they had gone with a HeadShok type suspension. I don't know if it's because I'm running 47mm Byways @ 35psi or what but my Slate is way more plush on the road than my carbon bikes. It soaks up vibrations like a sponge. Didn't think that the lefty would be that useful with such low travel but I can definitely feel a difference when riding the bike with the rigid lefty vs the oliver. So according to that article they basically just took the two models of the 2018 Slate and said ok these are 2019 now. The blue book value in the used market will be interesting as now 2018 and 2019 are the exact same bikes. That's pretty common though, barring paint jobs. Also the slate doesn't fit tall people AT ALL. List price is within $50. The Topstone has lower gearing as it comes with FSA Adventure 46/30 cranks and 11/34 cassette. The CAADX comes with Cannondale Si w/ FSA Rings 48/32 cranks and 11/32 cassette. The Topstone has Shimano flat mount hydro brakes while the CAADX has TRP Spyre C mechanical. It looks like the CAADX has QR hubs in the rear. Can anyone confirm? The Topstone is 12mm thru axle front and rear. The top tube and chainstays meet lower on the Topstone. The CAADX has much less sloped top tube and this will make it stiffer, no? Or is that just for carrying the bike during CX races? Both have a Fabirc Radius Sport saddle. This is excellent. The Topstone says it is dropper post ready. I don't know what that entails. Can someone explain how that is different? Yeah, QR rear for the CAADX. The more level top tube of the CAADX is better for carrying the bike in cyclocross races. The sloping top tube of the Topstone exposes more seatpost, so theoretically the additional flex from that should make it a bit smoother ride. No idea if that's enough to matter. The sloping top tube also gives more standover clearance which might matter to someone. I think the "dropper post ready" is just them pointing out that the frame is designed for internal cable routing for a dropper seatpost. Last edited by Pendergast; 08-27-18 at 11:37 PM. Pretty sure the CaadX is QR front and rear both. Full carbon thru-axle fork for the 2019 CAADX in the specs I've seen(Ireland and UK dealer websites.) Not sure if the full line of CAADX has it. Not sure how low the specs go in the 2019 CAADX either. Last edited by Pendergast; 08-28-18 at 12:34 AM. ahhh USA website still has the 2018's up. so that is what I was going on.